I've learned a lot in the month since I've been writing Curbing Cars here on Kinja. One is that we all love cars. Another is that they can leave big holes in our pockets. That economic punch is a reason why a lot of people have rethought the way they get around. Somebody asked the other day, "What is this doing on Jalopnik?" The answer is that Matt Hardigree and I see transportation as a mix — cars, planes, streetcars, motorcycles, bikes and your own two feet. If there's a change going on that affects the auto industry, you ought to be able to read and talk about it. Lots of Jalops said this week that the "Driving Light" idea sounds familiar. You have a car, but you also use your bike. You take the bus to work. You let your spouse take the car to work, and you work from home. Or you own a couple of cars, but only use one the most. Do You Find Yourself &apos;Driving Light&apos;? We've had a great conversation here on Kinja about all these topics, and I want to keep it going. That's where your help comes in. My Kickstarter project has five days to go. We need to hit our $10,000 goal by Monday, or we don't collect any of the 75 pledges we've gotten so far, including the ones from Matt and Ray Wert. Right now, we're just shy of $5,000. This is my 11th Kinja post, so here's what I'm asking. Pledge $11 (or make a pledge in an increment of $11) to the Curbing Cars Kickstarter. That gets you the ebook. After you pledge, send me a message on Kickstarter with your Jalopnik screen name. I'll thank you in a special post that will go out to all the Curbing Cars donors and I'll publish it here, too. Once we hit our goal, I'll come back for your stories and include the best in the book. Sound like a deal? See, you didn't even have to wait for the finance manager to approve it. 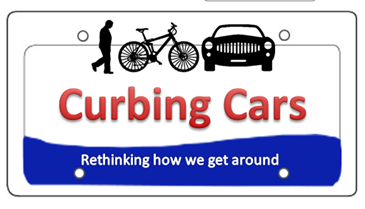 Support the Curbing Cars Kickstarter here.